View basket “Norge/Italia Airship Mast” has been added to your basket. A common sight in ports at the turn of the century, coaling barges such as these were used to refuel coal-fired ships. Coaling ships was an unpleasant and dirty task as the coal had to be transferred from barges to the ships bunkers in basket or sacks, normally by manual labour. 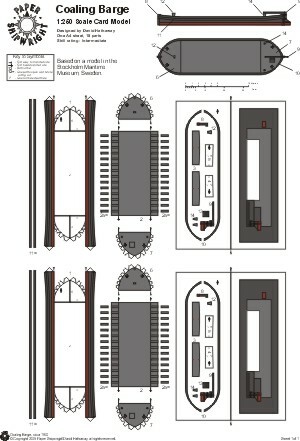 This free model is based on a scale model in the Stockholm Maritime Museum.